The take-home message is it's fun. We're talking cheese and chablis, steak and champagne, cardigans and tiny dogs and a frou-frou terrace overlooking the Domain parklands. What's not to like? Not much, judging by the queues outside the Victorian terrace that once housed South Yarra legend Lynch's. This is serial operator Jason M. Jones (Prix Fixe, the Stables of Como) teaming up with Hopkins River Beef guy Adam North to do CPR on the heritage building after a few non-starters run by Davis Yu. 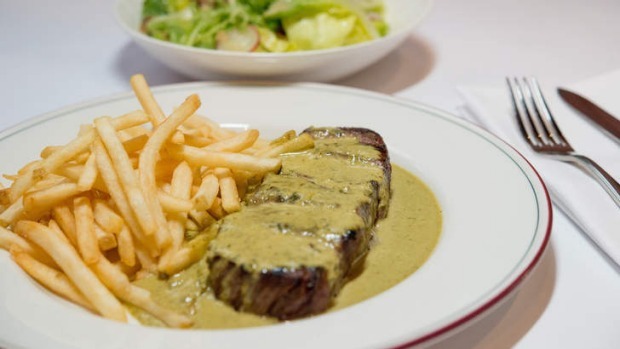 Their concept is simple: steak frites, Riviera pomp. That bistro classic – a grilled porterhouse backed by a well-dressed leafy green salad and a bottomless supply of salty French fries – is $39.90 and constitutes the length and breadth of the dining room menu with the exception of oysters, classic French desserts and grilled salmon or quiche for the beef-fearing, although the latter are only available on request. Is that steak good? It's pedigree Hopkins River meat, cooked to temperature and served sliced and swimming in head chef Simon Moss' take on the sauce of the restaurant's Parisian muse, Le Relais de L'Entrecote: a butter and egg yolk emulsion pinged with mustard (definitely), anchovies (maybe), fistfuls of tarragon and parsley and who knows what else. It's enough to make a second load of chips seem like a good life choice and also to boost the beef, which is lean in both fat and flavour. It's a solid rather than life-changing meat moment, but it doesn't seem to matter. This isn't Rockpool Bar and Grill with a garden. It's a poor man's country club with meat. You're not here to dine. You're here to peacock. You're here to drink. You're here to listen to live jazz on a Sunday afternoon while you knock back French 75s (gin, lime juice, bubbles) and think about your hedge fund, imaginary or not. What they're serving is steak, but what they're selling is the fantasy of wealth and luxury. You may not be the richest person sitting on that patio or looking out through the geraniums of the balcony above but for $39.90, you can pretend. So you're either eating in the upstairs dining rooms, painted menthol green, out on the terrace or in the front dining room, decorated like the adult section of MONA. It's all peachy walls and pink rosebuds with red velvet drapes and banquettes. 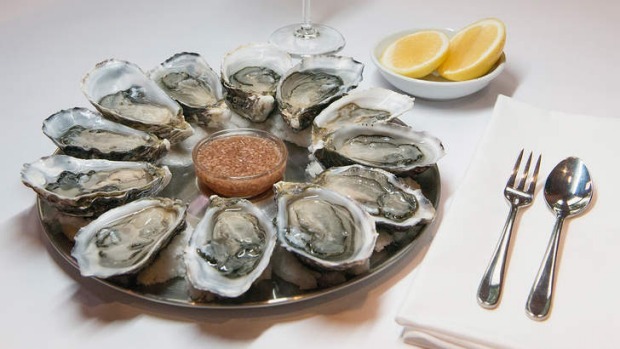 The no-bookings policy means you don't have much say, unless you show up at 5.30pm, which it's worth doing if only to catch the end of happy hour when plump, briny oysters are served for $2 a pop, lids ajar, with a punchy shallot and sherry vinaigrette. Later it's still worth holding out for a terrace space and the wider bar menu options. The cheeseburger rains sauce and flavour. Your blushing beef patty is shrouded in sharp cheese with crisp lettuce, fat gherkin slices, mayo and the herb-butter emulsion. It's also possible to have your steak frites experience in sandwich form, with medium-rare meat, herb butter and chips shoved in a forearm-sized baguette. The only drawback is the low-rent baguette, which is basically chewy air. Most misfires are small. The slab of terrine tastes like a really good pork and sage sausage, but could be warmer. Same goes for a leek and roquefort tart, which is pitch-perfect in flavour but appears to have been reheated, and not all the way through. It's a big business, and staffing is an issue. Apparently a chef resigned moments before we arrived one night, declaring the chips were frozen as he went. 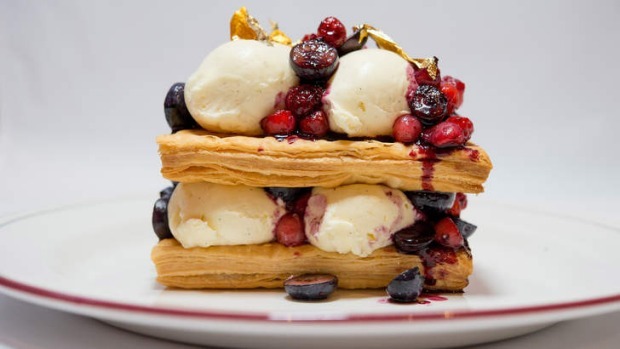 That possibly goes a way to explaining why our millefeuille (puffy pastry with chantilly cream and berries) is on the browner side of golden and the creme brulee has been over-sugared, scrambling the vanilla creme in the final torching. It's better the next time, as is a lemon curd tart, which is faultlessly sharp, rich and silky.It's probably also hard to find a full set of waiters with European accents, good looks and experience. But that's also small potatoes. They're a sometimes forgetful bunch, but that kind of adds to the charm. 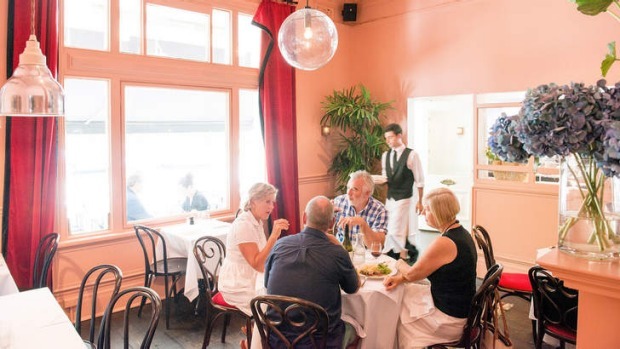 It feels like a local, and you want to forgive things for those happy-hour oysters, and the breakfast from 7am and the grills that fire til midnight. It's actually entertaining to watch the tables who send their meat back for one of the million reasons people cite when asserting superiority in steak restaurants. But it is you who is superior, knowing they're completely missing the point.